One of the reasons I had great fun at the London Design Festival (see 26th Sept post) was because I wore one of my porcelain collars there. Lots of people did a double-take looking at it, thinking at first it was made of fabric… and then, when they realised it wasn’t, said how much they liked it. I took advantage of the fact that, as with my porcelain stationery, it could be written on, so I penned my name on it – allowing visitors to my stand to identify who I was. I’ve decided to put a range of the collars on show at this year’s Ouseburn Open Studios event. Every one is different: some can be stitched onto a dress or top, others worn on a chain or a ribbon. I’ve used vintage buttons as well as vintage yarns on those which have a running stitch around the edge. Hard to picture? Then you must come and see them. The event takes place this year on Sat 24th and Sun 25th November, from 10am-6pm, with a free bus around all the Ouseburn venues. I’ll be in my studio (on the third floor of the 36-Lime-Street complex) on both days. Please come and introduce yourself! See: http://www.ouseburnopenstudios.org/venues/36-lime-street for more details. I’m delighted to have been contacted by curators at the Koroska Gallery of Fine Arts and asked whether I would allow some of my work to become part of their International Collection of Ceramics section. The curators had seen one my works at a separate exhibition in Slovenia, and contacted me to ask if I’d be prepared to donate it to the museum. To be honest, I had not heard of the Koroska Gallery, but, on looking it up, found it in the Saatchi World Museums list. It has an impressive pedigree, especially of Slovenian artists, but of internationally known artists too – these include Henry Moore, Ossip Zadkine, Daniel Buren and Victor Vassarely. So – what could I say? I told them I’d be delighted! The piece requested by the Koroska curators is a copy of one of my well-known items (see photo below), the award-winning Torn Notepad, which has won prizes as far afield as Japan. It will be installed at the collection shortly before Christmas. The Koroska Museum – in the town of in Slovenj Gradec – was established in 1957 in the former Yugoslavia, and now has over 1000 works in its permanent collection. I’ve been involved with the commissioning of some regional designer/makers for the upcoming exhibition at the Granary Gallery in Berwick, up on the Scottish border. It’s been a fascinating project. The gallery wanted selected artist-makers to visit their famous Burrell Collection and come up with personal responses – in any medium they like – to one or more of the pieces in the collection. The gallery asked me to to draw up a short-list of makers and then to manage the run-up to the opening day. It’s been even more fascinating to see what responses these makers came up with. As soon as I saw the the “washing day “ watercolour by Jacob Maris at the Burrell, of course, I was drawn to creating my own response too! Who wouldn’t be? It’s such a lovely picture, and it came as no surprise to learn that it is considered to be the most popular piece in the exhibition. For me, it was mesmerising to observe the poetic dance conjured up by the wind billowing and rippling the draped lengths of fabric. 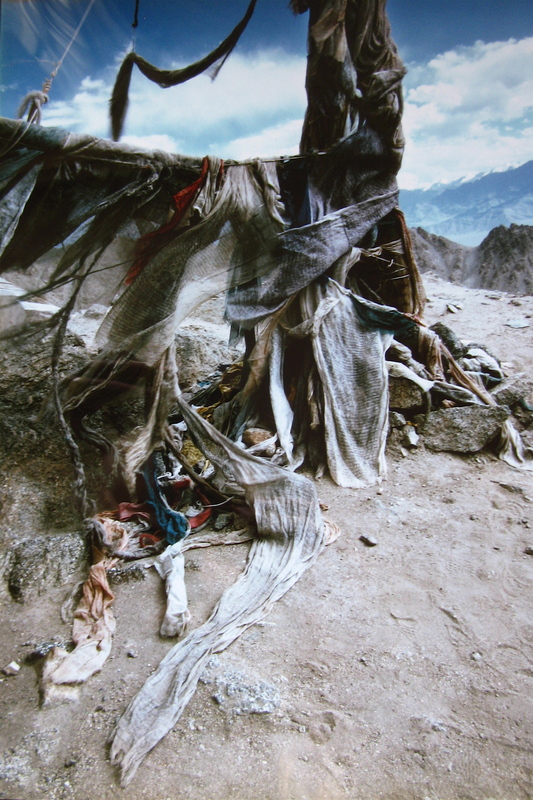 It reminded me of something almost sacred, like the prayer cloths I’d seen along the Himalayas I saw on a trip to India. So, I started to play around with some clay shapes In my studio. I draped a sheet of plastic over a string line and held a hairdryer behind it. Amazingly, it began to produce puffed-out shapes in a way that imitated the painting, which led me to think it would be possible to create something from porcelain. I began with quite a simple piece and became more and more adventurous with undulations and raised curves. I developed ways of supporting the clay into those different shapes and then – always the hard bit! – ways of removing the supports without breaking the brittle, dried clay. 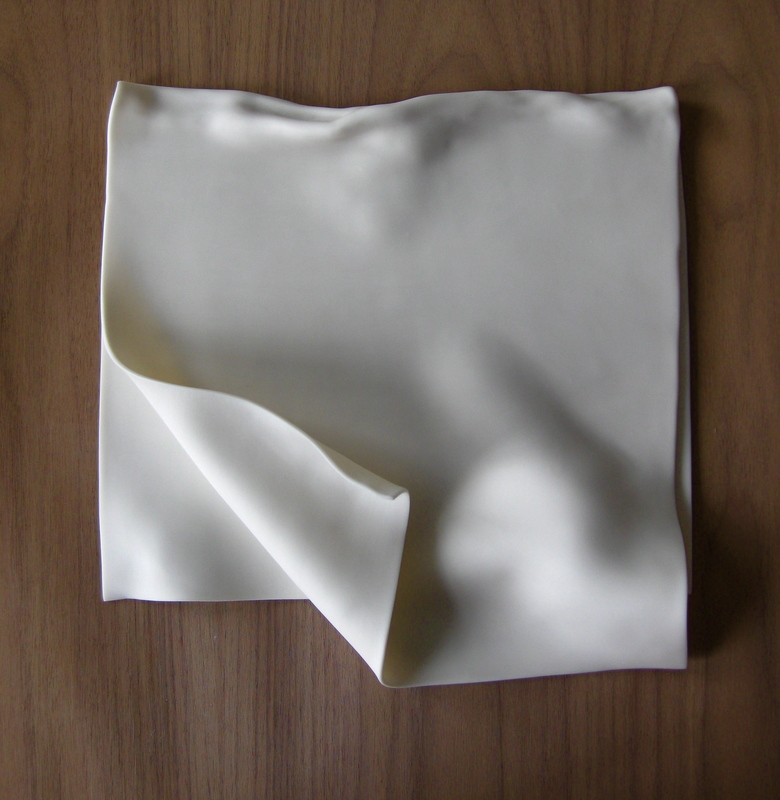 I’m still refining the process, but I’m very very pleased with how it’s going… Porcelain so well adapts itself to the smooth flow of a piece of linen flapping in the breeze. The exhibition opens on December… and features the artist-makers, Morag Eaton printmaker, Bridget Jones from Northumberland, Mandy Pattullo textile artist, and Bronwen Deane jewellery designer based in Newcastle. Work will be for sale – including my own, as the gallery also want it (though they will display it in a separate part of the gallery). Phew… I’m now back from five days at the London Design Festival, where I had a great time. I was there with a number of neighbour designers from here in the North-East. We were all under the banner of ‘Design Event’ and had a stand in the ‘Tent’ part of the festival. Tent takes place in a huge former brewery in Brick Lane, which is incredibly lively at the best of times, so not only was the festival fun, so was going out for lunch! Karen, who, with her team, Kala and Olivia, organised us all and did a great job – we put on a very professional front. I was fortunate to have at least a few serious enquiries and orders; and who knows what might happen down the line? Many people were drawn to our stand by the incredible bubble-vase which was being promoted by the lads from Psalt. 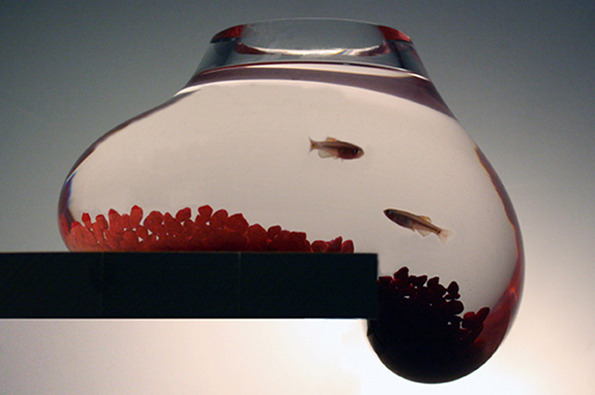 They are very nice lads and very inventive, and I really hope the bubble-vase takes off. It’s one of those things that could just take the public imagination – and suddenly you’ll be seeing it everywhere. I managed to make a couple of festival parties too. At one of them I was introduced to Palinka, a Hungarian version of Schnapps. Sadly, there weren’t many products in the festival that fired my imagination, which surprised me. I think that, in this recession, even new designers are playing it safe, and there was a distinct retro feel about a lot of products. I did like one item though – a sort of jigsaw-style paving, which could be customized. All in all, being in London at such an exciting time was a lovely experience. It’s strange how things work out. I’ve been experimenting with using pen and ink on my porcelain table place-names collection when I just found the perfect pen, made by the German firm Lamy. I’ve always loved the feel of a fountain pen, and the way the nib smoothed over the porcelain surface was quite exciting (well, it was to me). 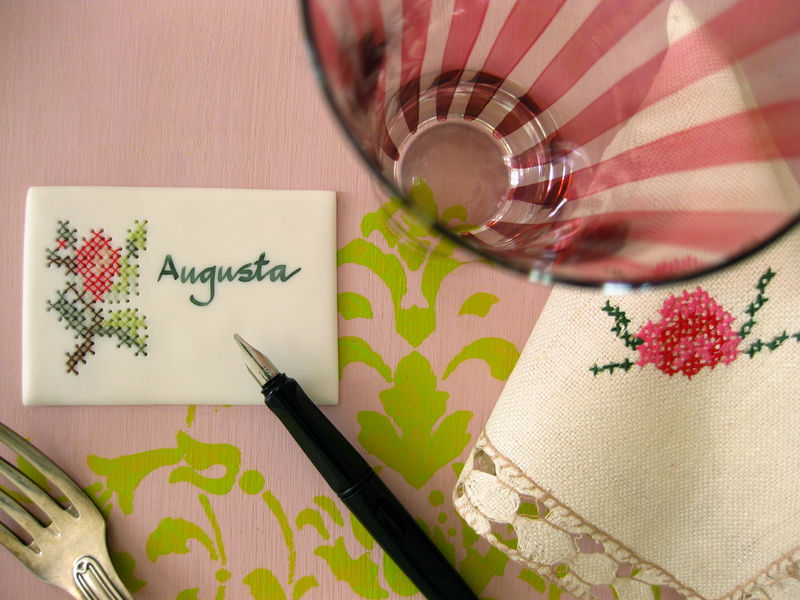 Luckily, the pen uses an ink that is washable so that anyone using the table-place names can use them over and over and over…. Even more interestingly, they then sent me back a report, which confirmed what I’d thought – their pen loves porcelain. The product development manager was very complimentary. I wonder if anyone saw the programme on BBC4 yesterday – A History of Art in Three Colours, White. It was one art critic’s view of the history of the colour white in European culture: starting with Winckelmann, going via Wedgwood and Whistler and Le Corbusier up to its use in the monumental buildings of Fascism. It was an interesting programme and made me think a lot, because, of course, much of my work is in pure white porcelain. White represents many things, including coldness and bareness, but also including purity and simplicity. I think the latter interpretations are why I like white: it tells no lies and gives no misleading impressions. It just is what it is. If you get a chance I would recommend an immediate visit to Sunderlands’s NGCA gallery. Kelly Richardson‘s mesmerising installations there make for a wonderful, alternative day trip. I often found myself thinking about the differences that might exist between design and art, and also between art and design and functionality. If there are any. (I think a lot too about sustainability, but that’s a slightly different matter). Imagine my surprise – and admiration – when I saw an article about this piece: The Square Head (La Tete Au Carre). 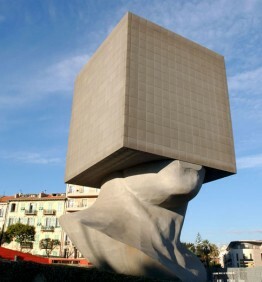 The Square Head is… a monumental sculpture, a working library building, and a beautiful item – all at the same time! The piece was designed by Sacha Sosno and is sited in Nice, France. Quite an achievement. I’ve turned my house upside down – because I’ve been in re-organisation mode, but I’m much happier with the way things are functioning at home/work for me now. Which is good. Meanwhile, work-wise, I’m racing against the clock to get everything ready for TENT, which is part of the London Design Festival. 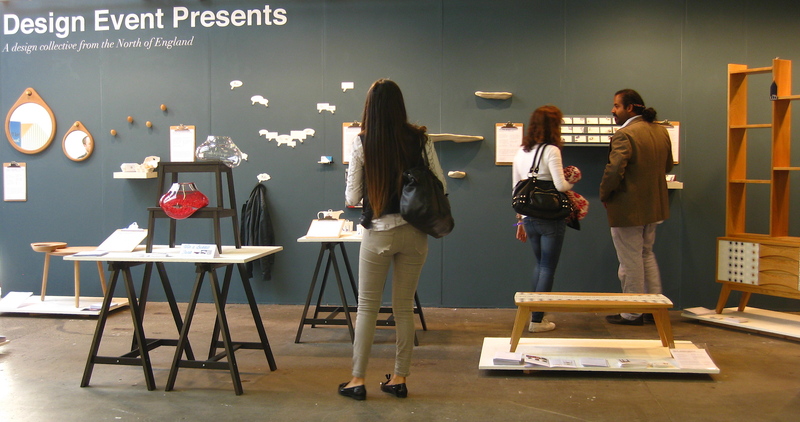 The LDF takes place in late September, and, with luck, should provide a good showcase for my work. I’m hoping for a few commissions, and I’ve been refining two of my ranges – the table-place names and the undulating shelves. A lot of friends and clients have been very kind in suggesting ways that the design of them could be tightened up, and I’ve been experimenting. Still, I have to get down to making some finished samples now, ready for the show. One nice thing about the festival is that I’m going down there with a group of colleagues from here in the North-East. Under the umbrella-name of ‘Design Event’ we are going to share a stand. More about that nearer the time, but it’s good to think I’ll be there at the festival with friends. One downside to all this whirlwind is that I’ve had to cancel my next workshop series, which was supposed to take place in September. Well, I had a terrific time attending the awards ceremony at the This beautiful country (it’s not much bigger than Wales!) on the edge of the Austrian Alps really is one of my favourites now. As you know, my ‘Torn Notepad’ work had been short listed for a prize, but it didn’t win (sadly). The winners turned out to be working more in the line of ‘conceptual art’ ceramics, and I am more at the design end of the spectrum, so I didn’t feel badly about it. 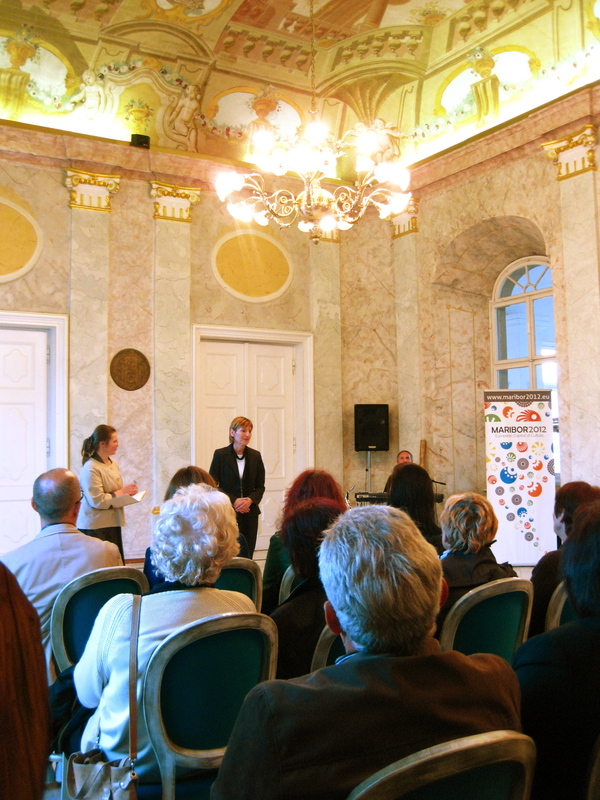 The ceremony was conducted in a beautiful (if somewhat worn) baroque palace called Betnava Manor where the Association of Slovene Artists is based. The palace is situated in deep countryside some miles outside Maribor (this year’s European capital of Culture) but even so, over a hundred people attended. 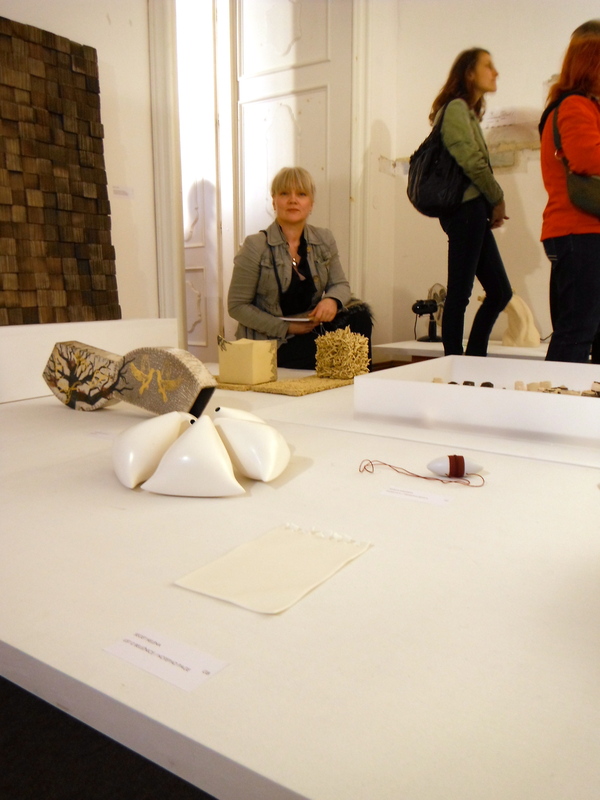 Ceramicists from all over the world were there. Just some of those I managed to talk to were from Canada, Turkey, the US and more… and even Slovenian TV turned up! 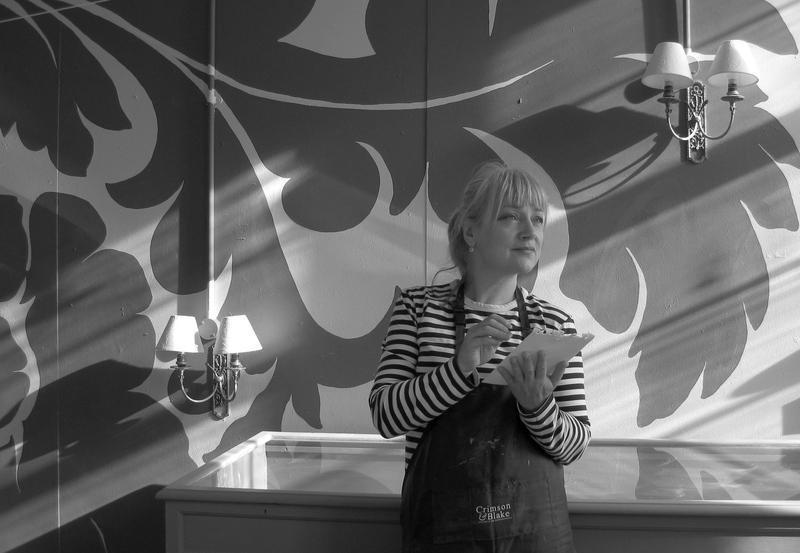 I travelled back from Maribor with another English artist, Corinna Thornton, who’s now working in Norway – check out her work (http://corrinathornton.info/home.html) if you get the chance. All in all, it was a pleasant evening, with specially composed music to boot, and it was good to see my work displayed among all the international entries. While in Slovenia I also took the opportunity to visit the capital, Ljubljana, where I met up with another ceramic designer, Nika Stupica, at her studio in the city. All in all – a fabulous few days. I thoroughly recommend Slovenia! You can see more about the awards finals on the UNICUM website – http://www.unicum.si/awards.html <http://www.unicum.si/awards.html> .